But the other day a gang did come, they were filled with whiskey, gin and rum. And they took me out in the broiling sun to play a game of ball. And they laid me out by the fence to die on the day that I played baseball. Bad luck to you O’Shaughnessy, and the way that you twirled the ball. And they rubbed me down with a Turkish towel on the day that I played baseball. I had a head on me like an elephant’s trunk on the day that I played baseball. And they sent me home on a cattle train all the day that I played baseball. A seasonal selection from the repertoire of Mike Dean: Irish American lumberjack/saloon-keeper who lived in Minnesota from 1885-1931. Dean’s self-published songster The Flying Cloud contains many songs from the Irish-American music hall stage and this one falls squarely in that genre. In my search for information on Mike Dean’s life in Hinckley, Minnesota (1885-1908) I have found that baseball was wildly popular in Hinckley in the 1890s. Local papers in 1889 proclaimed a “baseball craze” in Hinckley and summer papers thereafter were filled with accounts of the exploits of the Hinckley Monarchs. Interestingly, the sheet music I found for Rooney’s version of his own song (from which I took the above melody) only had four verses where Dean’s has six. 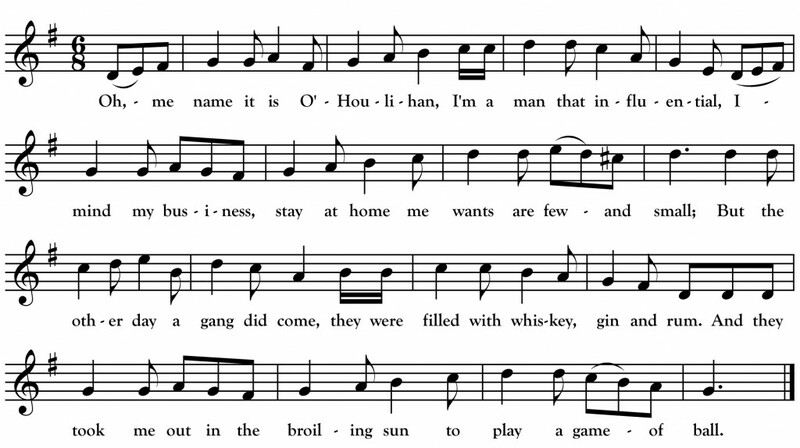 Perhaps Dean composed the verses (missing in the sheet music) about the ball-twirling O’Shaughnessy and the catcher’s intoxicating “punishment.” Maybe the added verses were even based on experience?